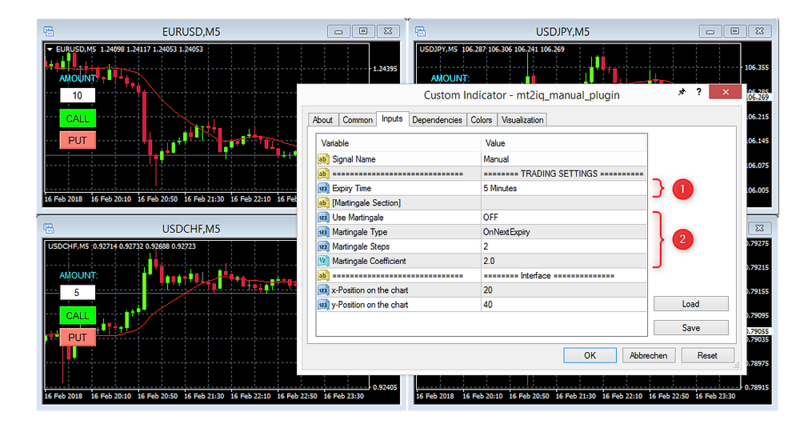 The manual trading plug-in is used to place trades directly from MetaTrader charts. This is very convenient for those traders who trade manually and do technical and fundamental analysis themselves. Now you don't have to lose the valuable time for switching currency pairs and setting the trading amount on the iq option platform any more! Just a click on Call/Put button on your MetaTrader chart is enough to place a trade fast and precise. Expiry Time: Specify the expiry time in minutes. Martingale Type: OnNextSignal means that after a loss trade the martingale will be applied only on the next signal of the same currency pair. OnNextExpiry means that after a loss trade the new trade will be generated and the martingale will be applied on the next expiration. Martingale Steps: Defines the lenth of the martingale series after the loss trade. © 2017 - 2019 MT2 Software Ltd.
MT2IQ functions with the IQ Option™ platform, but it is 3rd party software. We are not partners of IQ Option™.